Colgate Total Toothpaste is sold as a teeth cleaning product from the Colgate Palmolive Company. Other than water and flavoring, the product has 13 different ingredients that make up the formula. 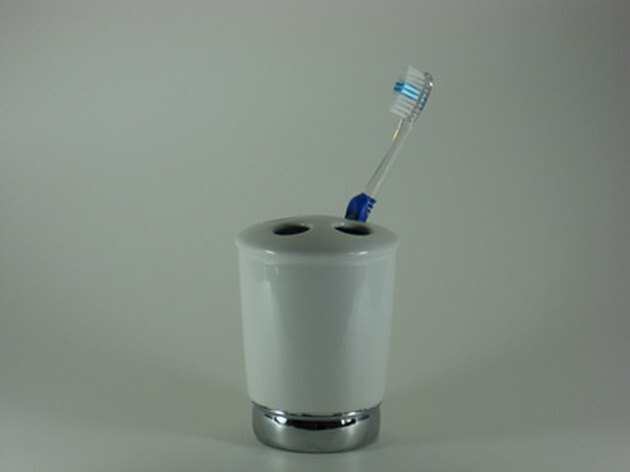 Toothpaste is not meant to be swallowed, and should be rinsed after using. Swallowing too much toothpaste can give side effects of dizziness, nausea, headache and vomiting, according to the U.S. Department of Health and Human Services. Sodium fluoride is the active ingredient used in many dental products. It is an anticaries agent that prevents the formation of cavities in teeth. Other uses include lessening mouth odors and polishing the teeth, according to Cosmetics Info. It is also known as sodium monofluoride. Thickeners work to bulk up a product to keep it from being too thin. Carboxymethylcellulose sodium, carrageenan and hydrated silica are all thickeners in Colgate Total Toothpaste. Carboxymethylcellulose sodium makes a cream based product, while hydrated silica and carrageenan bind with water to absorb it and thicken the product. Sodium hydroxide is added to Colgate Total to regulate the pH levels of the formula. The Food and Drug Administration has deemed it safe for use, according to Cosmetics Info. Absorbants are those compounds that are used to take up water in the formula. The absorbant in this toothpaste is propylene glycol, which also helps as a stabilizer. It can also defoam a compound and help maintain its moisture levels. Sweeteners are used to alter the taste of a product. Sweeteners used in this toothpaste are sodium saccharin and sorbitol. Saccharin is 300 times sweeter than sugar. Sorbitol also functions by pulling water to help moisturize. Binders work by keeping a formula bound together in the compound. The binder in Colgate Total is called PVM/MA copolymer. Hydrators help items glide smoothly and hydrate the product for better use. The hydrator in this formula is glycerin. Colorants help a product look a certain way, either by adding a dye or changing the transparency. The colorant in this toothpaste is titanium dioxide, which is used to whiten up the product and make it opaque. Preservatives help keep a product from spoiling and harboring microorganisms such as mold and fungi. The preservative in this product is triclosan, which according to Derma Doctor may also be hypoallergenic. Surfactants help items glide easier across the area upon which they are used, while cleansers help clean the area. Both of these functions apply to sodium lauryl sulfate, or SLS, in the toothpaste. What Are the Ingredients in Johnson's Baby Lotion?